PITTSBURGH (AP) The offense expected to light up scoreboards is instead grinding it out. The way the Pittsburgh Steelers defense is playing, it hardly matters. The team expected to compete for a Super Bowl berth looks the part at the season’s midway point. The Steelers just aren’t doing it the way most envisioned. Rather than race up and down the field with an offense that features the highest-paid wide receiver and running back in the league, it’s the remade-on-the-fly defense has propelled Pittsburgh. The proof came in a 20-15 victory over Detroit on Sunday night. And while Pittsburgh gave up 482 yards to Matthew Stafford and company, the Lions never reached the end zone. Five times Detroit ventured inside the Steelers 20. The results? Three field goals and two failed attempts on fourth down. Pittsburgh (6-2) heads into its bye week firmly atop the AFC North after its third straight win. 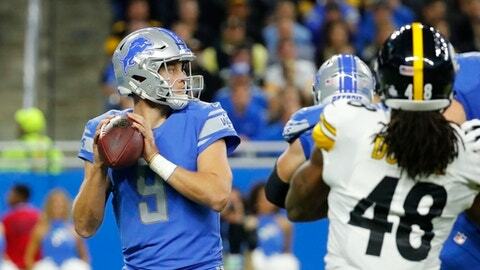 While the defense slipped from second to fourth in total yards after letting the Lions go up and down Ford Field, the Steelers are tied for second in points allowed. Heady territory for a unit that doesn’t have starter over 30. ”I know we had some mishaps, but I’m glad we’re 6-2,” defensive end Cameron Heyward said. With considerable room for improvement, particularly the $92 million offense. The unit that once – albeit not this season – said it wanted to make scoring 30 points the norm has struggled at times to reach 20. Le’Veon Bell’s slow start following his decision to skip training camp didn’t help. Neither has the enigmatic play of wide receiver Martavis Bryant, who spent Sunday night on the sideline in sweat pants after being deactivated by coach Mike Tomlin for making the ill-advised decision to vent his frustrations on social media . Three straight victories have followed and while Roethlisberger is still searching for consistency – his completion rate (61.1 percent) is his lowest since 2008 – he’s developed a rapport with rookie wide receiver JuJu Smith-Schuster, taking some of the pressure off All-Pro Antonio Brown. Smith-Schuster had career highs in receptions (seven) and yards receiving (193) against the Lions, showcasing a burst even he wasn’t sure he had on a 97-yard catch-and-run for a touchdown in the third quarter that served as the longest pass play in the franchise’s 86-year history. Smith-Schuster also sealed the win by taking a shovel pass from Roethlisberger and bulling for a first down with less than two minutes to go, a conversion that allowed the Steelers to run out the clock. ”The best player under 21 ever and I mean that,” Bell said of his teammate, who turns 21 on Nov. 22. One with a burgeoning national profile. Smith-Schuster’s ”hide and seek” touchdown celebration with Bell a week ago went viral. Then the bicycle he rides from his apartment to the team’s training facility was stolen , leading to breathless and not entirely tongue-in-cheek news coverage before it was recovered. Smith-Schuster made light of it after his record-setting score against Detroit, taking a chain and looping it around a stationary bike on the Pittsburgh sideline. It was a light moment on a night where the Steelers again struggled to put away an opponent. For all of the talent in the huddle, Pittsburgh is 30th in the league in converting red zone possessions into touchdowns. Even the typically sure-handed Bell had a momentary lapse, fumbling at the Detroit 21 late in the second quarter. ”`I’m glad we got out of the game with a `W’, but we still can go back, look at the film and look at, `Oh look, we can clean this up. We can do this,”’ Bell said. Maybe that’s the surest sign of maturity on a team that will get a much-needed break before beginning the second half of the season at injury-ravaged Indianapolis on Nov. 12 before playing five of their final seven at Heinz Field.